Independent U.S. Senate candidate Greg Orman talks to workers at a healthcare company on Wednesday, Sept. 10, in Overland Park, Kansas. You know it’s a strange election year when a party benefits from the removal of its own candidate from the ballot. But that’s exactly what’s happened in Kansas. On Thursday, the Kansas Supreme Court ruled that the Democratic candidate, Chad Taylor, who earlier withdrew from the race, did not need to have his name listed on the state’s U.S. Senate ballot. Although recent polls had shown Taylor’s share of the vote diminishing, they had also shown Orman performing better against the Republican incumbent, Pat Roberts, if Taylor’s name wasn’t included. With the court’s ruling, the FiveThirtyEight model is now using only those polls that didn’t include Taylor. As a result, it has Orman as a 64 percent favorite to win the race, up from 50 percent before. But there’s still an enormous amount of uncertainty in Kansas. The surveys testing matchups without Taylor were polling what was — until Thursday — a hypothetical race. Furthermore, the polls that didn’t list Taylor also didn’t include the Libertarian candidate, Randall Batson, as an option. Roberts has relatively poor approval ratings among Republicans, and it could be that conservative voters who are dissatisfied with him will opt for Batson before Orman. Or perhaps not — but it’s a choice they’ll get to make in November, so the polls should probably allow them the option, too. The FiveThirtyEight model does hedge against the polls somewhat with its “state fundamentals” estimate — a forecast of the election outcome that doesn’t rely on head-to-head polls. You can find much more detail about how the FiveThirtyEight model works here. But the intuition behind it is pretty simple: Kansas is a very red state, and this is a somewhat Republican-leaning year. If you weren’t allowed to look at polls, you’d presume that Roberts would be heavily favored. 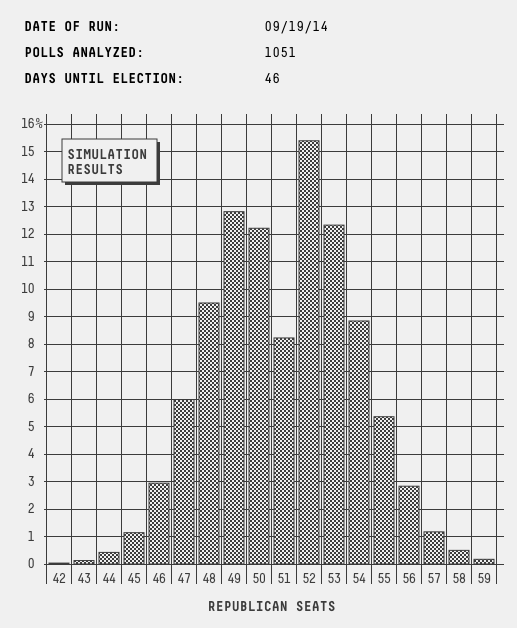 The FiveThirtyEight model, however, puts a very light touch on the fundamentals. Even in Kansas, they represent just 15 percent of the forecast — polls get 85 percent — and that proportion will fall into the single digits as more polls are released that test the matchup without Taylor’s name included. For what it’s worth (not a lot) my subjective feeling is that the race is still more like a true tossup, and Roberts will improve his standing among Republican voters as they contemplate electing a relatively liberal candidate who could give Democrats control of the Senate. This phenomenon has already manifested itself in Kentucky. Democrats there have a compelling and moderate nominee in Alison Lundergan Grimes, and the Republican incumbent, Mitch McConnell, is deeply unpopular. But McConnell has pulled into a consistent lead in the polls. And the phenomenon manifested itself in a different way in a special election last year in South Carolina, where former Gov. Mark Sanford eventually won his U.S. House race against the Democrat, Elizabeth Colbert Busch, despite very low favorability ratings (a result of Sanford’s extramarital affair). We’re living in a very partisan country, and partisanship usually wins out in the long run. Nonetheless, Orman only needs to hold his lead in the polls for another 46 days, and Roberts’s campaign had a very slow start, with paltry fundraising numbers for an incumbent and a host of other problems. Roberts will have to accomplish in mere weeks what candidates like McConnell have had months to achieve. The Daily Kos Poll Explorer model, developed by Drew Linzer, uses polls only and gives Republicans a 54 percent chance of a Senate takeover. The HuffPost Pollster model is also “polls only” and puts the GOP’s chances at 56 percent. The Washington Post’s Election Lab model, which includes fundamentals, has Republicans’ chances at 62 percent. The New York Times’ “Leo” model, which uses polls and fundamentals, has the GOP’s chances at 58 percent.